Meraki – Mesh networking & portable solar power. Awesomely innovative. 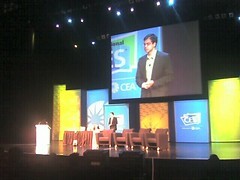 Sanjit Biswas, CEO of startup Meraki. Speaking on bringing technology to developing world. Meraki was a real standout here at CES in terms of bringing cheap, powerful innovation to the connectivity space. They are using mesh networking to bring cheap connectivity to remote areas like a Chilean fishing village (see this mesh network real time at Meraki.com). Surprisingly they are also after some pretty big markets such as San Francisco, where even Google is conspicuously failing to bring free ad supported wireless broadband . The company expects that it will only cost a few million dollars to cover all of San Francisco, compared to the $14 to $17 million estimated for the Earthlink/Google plan. “There is a pretty drastic cost advantage,” says CEO Sanjit Biswas. “Our network will come in at the low, single-digit millions,” he predicts. Meraki will even offer residents free repeaters to amplify the WiFi signal inside their homes, and shoulder the entire cost itself rather than ask for public funds.